Two days ago found me in the parking lot of an outdoor store—one of those chains that sells everything from Go Pros and hiking books to mountain climbing equipment and all weather socks. I wore a fluorescent yellow vest and a black helmet and stood in front of a green bicycle painted with flowers with a wicker basket on its front. The bike looked a bit like Austrian elves had decorated it, but I was captivated by the red tassels on its handles and by the silver bell that dinged like a doorbell, so I had selected it for my test ride. For years, I had been without a bicycle, my last one having rusted away, and I was at the store to see about getting a new one. Apprehensive, I stood in front of the bike wondering if that maxim “it’s just like riding a bicycle – you don’t forget!” was true. My children picked up on my concern, and my daughter called out, “Don’t worry, Mama. Just take a breath and step on the pedal.” I looked at her, encouraging me, and felt a slight twinge of humiliation. Was it embarrassing that she was a better bike rider then me (which doesn’t say much since she learned to ride without training wheels only two weeks ago), or should I feel proud that the child was eclipsing the parent? I decided to go with proud (my ego, small as it is, couldn’t bear it any other way), and stepped up on the bike. I wobbled a bit and then found a rhythm. Around the parking lot I went, wind in my hair. I rode up and down the aisles, remembering how much fun it is to ride a bike, to do something of joy. I stopped in front of my husband, nodding like my daughter. I would get a bicycle. All over the Internet, you’ll find letters parents write to their children on their birthdays. I have been known to do this once or twice myself. What about writing to yourself on your birthday? 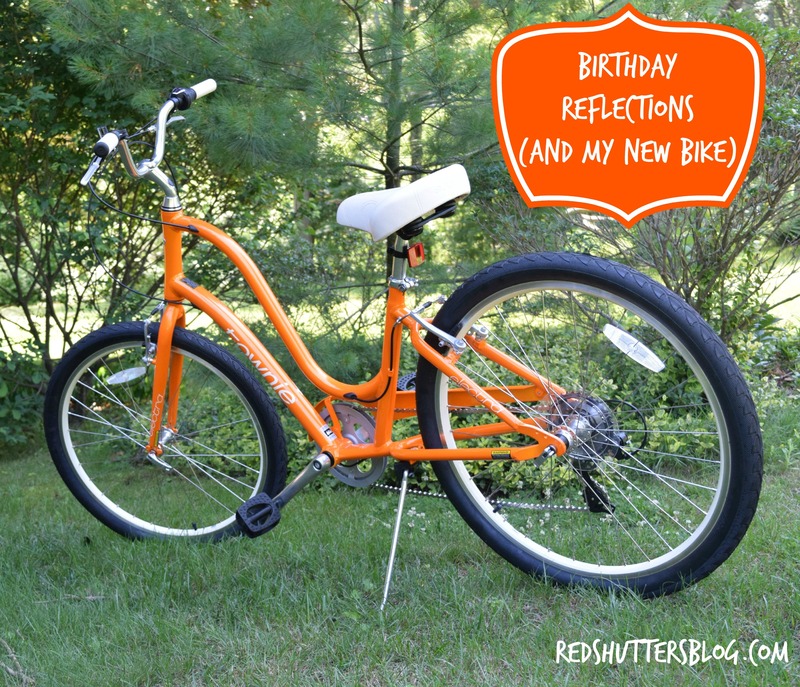 Birthday reflections for the grown-ups, if you will? Well, today is my birthday, my still-close-enough-to-round-down-to-40 birthday. It’s not a particularly noteworthy year, though, the older I get, the more I realize that all milestones—no matter how big or small—are worth celebrating. I’m having a quiet birthday, a day surrounded by love and hugs. I’ll spend the day being taken care of by my family. Delicious meals will be cooked for me. I will not empty or load the dishwasher, nor will I fold and put away loads of laundry. I will not pick up (or step on) Legos. I will drink tea while reading my book in my pajamas, under the covers in my bed. I will read Facebook birthday messages, and receive texts and emails of good wishes. I will smile while my children laugh out loud watching cartoons and playing hide and seek in my closet. I will listen to my mother call me (while I haven’t yet woken up) to sing me happy birthday. I will sit in my quiet bedroom and write. I will be feted. And, perhaps most importantly, I will be grateful. I’ll be grateful for my family, for friends, for the roof over our head, for the blue hydrangeas growing in our backyard, for the sun shining overhead. I will be grateful (though it may be hard) for the wrinkles crinkling around my eyes and for a body, while different than it once was thanks to pregnancy and age, that can run a 5k, can still carry my fast-growing children, and can work tirelessly for people and causes in which I believe. I’ll be grateful for being able to let go of the things that don’t matter: what other people think and their negativity, and small slights that may have undone me in my twenties. I’ll be grateful that I listen better now than I once did—and that I hear what is being said. I’ll be grateful for the ability to say no to opportunities or responsibilities that aren’t right for me—and to not fill guilty about saying so. I’ll be grateful for memories that sustain me and for friends who I can always count on for telling me things straight. I’ll be grateful for the fact my children are different than me in so many ways, while I quietly relish in our similarities. I’ll be grateful for a husband who is unfailing supportive, who makes me laugh, and who can truly fix anything that breaks in our house. I’ll be grateful, as I have always been, in captivating books, beautiful music, and kindness. My new bicycle is bright orange with wide handles and a comfortable seat. It has hand brakes and big tires, and rides quietly, projecting calmness. It’s a good message for me about finding new rhythms and not being too scared by the prospect. We took our first family ride yesterday—and we’ll go again later today. Yesterday’s journey was a short one, around our neighborhood. We rode out of our driveway to the right, and then turned left past the homes of my children’s friends. Then left again and left and right and home. Was it half a mile? Perhaps. I held tightly onto my handles, back straight, keeping an eye on my children, speeding ahead of me, while looking out for cars. My daughter fell three times; each time she stood up, frustrated with herself but fine, getting back on the bike after a brief talk with my husband about why she fell. She never faltered in her desire to keep going. She laughed and called out to her brother, her pink bike and purple helmet chasing after him down the street. When we arrived back on our house, my husband stood waiting for me. “I’m a chicken,” I said, stopping the bike in front of him. He nodded, agreeing. “What are you afraid of? Falling?” he asked. The other thing about birthdays is they mark time so cleanly and so efficiently. Today, you are older. Today, another year has past. Today, today, today. Hand in hand with today is tomorrow, of course, and that is what I find most fascinating about birthdays. As a child, we use the candles on our birthday cake to wish for something to happen next—a new toy to arrive, perhaps—but what do we wish for as an adult? Not a new toy, I bet; those we can, if we really need or want them, figure out a way to get them ourselves. Maybe we wish for something good to happen for a loved one, or health, or new adventures. Maybe we don’t wish at all, but use that all-too brief moment when everyone stands still, watching and wondering, as we pause over the cake to make our wish and blow out the candles, to breathe in deep that anticipation, that excitement, to hold on to it for another day, another year, another time. Now, for me, in addition to a day of being grateful, birthdays are a day to try new things (i.e., bicycles) and to take stock. What makes me happy? What doesn’t? What is good for my family and me? What do we need to change? Where should I be on my next birthday? It’s the plus, of course, about having a birthday in July; I was born at a perfect mid-point in the year, six months after the New Year when thoughts like these often rise to the conscious mind. Having a birthday in July as a child was sometimes disappointing—birthday parties often didn’t came together because friends were away for the holiday—but, as an adult, I find that it works well for me. Another lesson of life: our point of view changes and we can learn to embrace that which didn’t work for us before. So, here I am: another birthday, another year. It finds me grateful, reflective, and ready to get out there, no matter how scraped up I might get. Happy birthday, my friend. I hope your bike takes you on wonderful adventures. What a wonderful writer you are, my friend. And since you are so much older than I, I am taking in all the wisdom of your 43 years! I am grateful that with my 42 years, 10 months and 37 days, that I have known you for nearly 24 of them. The world is a better place because of you.